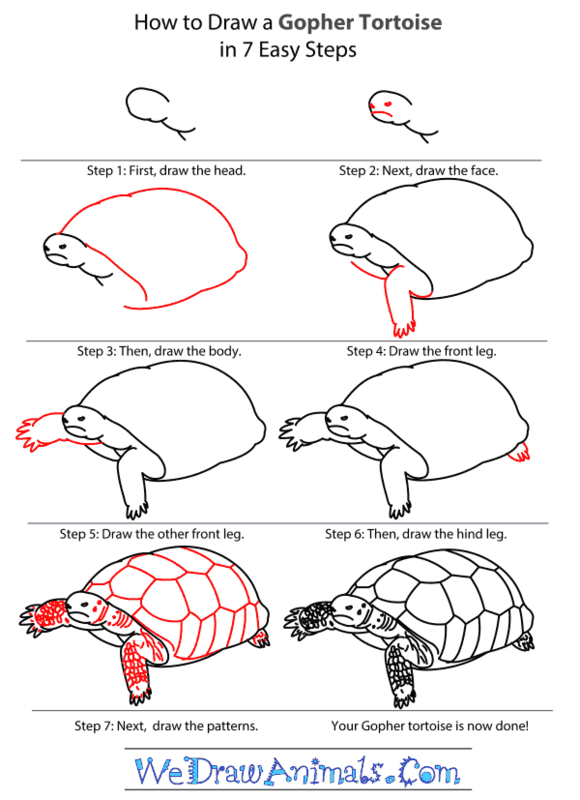 In this quick tutorial you'll learn how to draw a Gopher Tortoise in 7 easy steps - great for kids and novice artists. At the bottom you can read some interesting facts about the Gopher Tortoise. 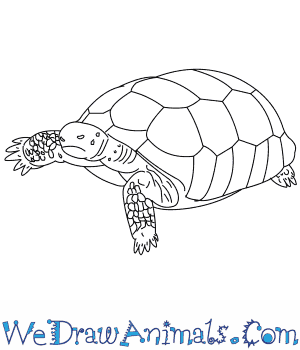 Step 1: First, draw the rounded head of the Gopher Tortoise using curved lines as shown in the image. Draw the neck using curved lines. Step 2: Next, draw the face. 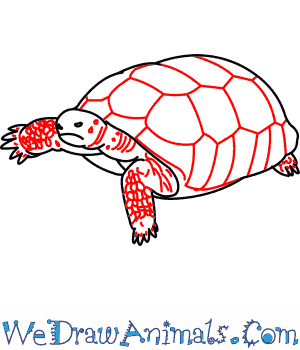 Draw two tiny ovals for the eyes of the Gopher Tortoise and add a small downturned, curved line for the mouth. 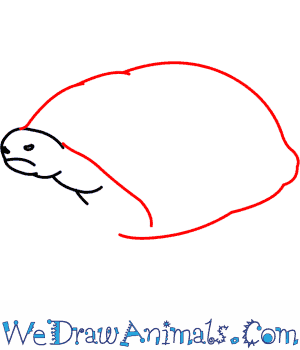 Step 3: Draw a fluffy, rounded rectangle, sort of like a pillowcase shape for the outline of the Gopher Tortoise’s shell using curved lines. Step 4: Draw the right front leg using L-shaped lines as shown. Add five small claws to the foot using small jagged lines. Step 5: Draw the other front leg using curved lines. Make the leg slightly slanted so that your drawing looks more realistic. 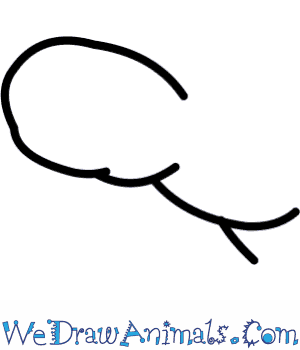 Draw five small claws for the foot using small jagged lines. 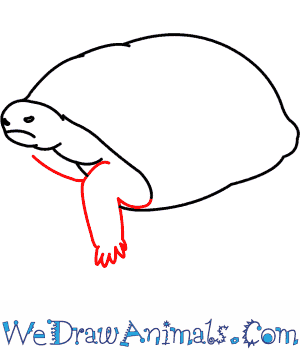 Step 6: Draw just the five claws at the base of the Gopher Tortoise’s shell for the hind leg. Step 7: For the patterns on the shell, draw hexagon shapes all over the shell as shown in the image. Add small looping lines to show the scales on the Gopher Tortoise’s legs. 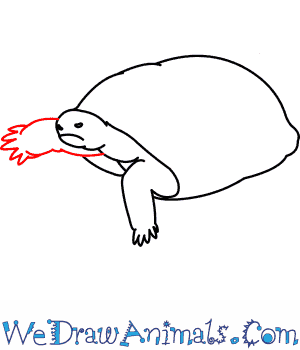 Add some dots and dashes on the neck and some dots on the claws of the tortoise to complete the drawing. Once you have finished your drawing, you can add color to it. Gopher Tortoises are found in the south of North America. They like to live in sandy areas near leafy forests. Their shells grow with them and are brown or tan in color. The shell can measure between 107 and 240 millimeters long. Gopher Tortoises like to eat plants especially leaves and herbs. Gopher Tortoises live on land and dig burrows for themselves. After they live the burrow other animals like the gopher frog, the burrowing owl, and the indigo snake move right in to it. Females can lay 8 eggs per mating season. Gopher Tortoises can live up to 60 years. There are 360 species of animal that benefit from the Gopher Turtle’s burrowing habit. A Gopher Tortoise’s first winter is spent with its mother. Then it moves on and digs its own home. In ancient times, the Gopher Tortoise was used as money. Activity: Read your kids the story of “The Tortoise and the Hare.” Then give them some paper, some crayons or whatever you like and ask them to illustrate their favorite part. If you feel ambitious ask them to draw the “whole” story. You might be surprised what they took away from it.